I first learned to make a simple white sauce in junior high. 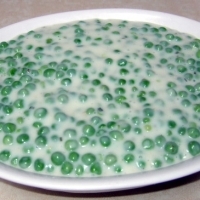 My introduction to this culinary version of a house's foundation was to make a dish called creamed peas. The instruction was to make a white sauce, then add it to drained, canned peas. Let me just go ahead and say it... YUCK! I can think of many ways to teach someone about white sauce, but this would not be my go-to recipe. First of all, even though my family was a big fan of fresh healthy veggies, the green pea was not on my mom's list of faves, so we seldom had them for dinner. The extent of my knowledge was the occasional can of tiny, dull colored, Green Giant LeSuer peas. The first time I made this sauce, I did not have a good grasp of the importance of the roux (pronounced roo, as in Kanga's offspring.) This combination of melted butter and flour is the thickening agent. My white sauce was lumpy and tasted of raw flour. I did not know to whisk out all the lumps or brown the roux before adding the liquid. 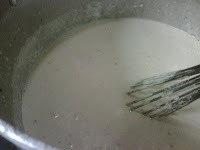 The other key to a good sauce or gravy is to heat your liquid close to boiling before adding to the roux. This will help it to blend easier. The large, mealy canned peas provided by our Home Ec teacher were equally icky... that, I believe is the technical term. Now mavenettes, who can tell me why it is important to know how to make a good bechamel? Answer: It is a structural recipe... Let me explain. Here are just a few dishes that contain this simple sauce: White pizza, (Yes, pizza,) Bolognese Lasagne, anything with GRAVY. 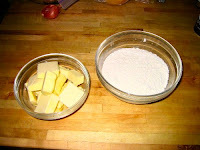 Many casseroles start with a bechamel or gravy base. One of my favorite vegetable dishes is Broccoli Au Gratin, a casserole made with blanched broccoli, bechamel, swiss cheese, topped with bread crumbs and baked in the oven... yum! More recipes using your newly discovered bechamel or veloute will follow in future posts and you must be prepared. In heavy saucepan, melt butter over low heat. Whisk in flour. You will have a paste-like consistency. This is called the roux. 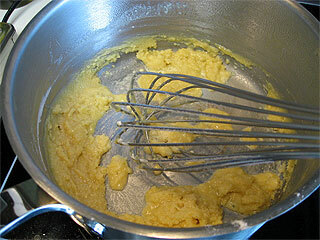 Whisk until roux is foamy and no lumps are present. Brown roux for 2-3 minutes to prevent a floury taste in sauce. But remember that the darker the roux, the less it will thicken. Browning the roux gives it a richer, deeper flavor, but your sauce will be thinner, so adjust the recipe ratio to compensate for this reaction. Hey, chemistry AND math... who knew? Remove saucepan from heat and slowly whisk in small amounts of hot milk, making sure it is a smooth consistency before preceding. Return to heat and add remaining seasonings. Simmer uncovered for approximately 15 minutes. Several are used for different dishes. Here is one example of a variation of this classic French sauce: Sauce Veloute is similar to white sauce, but substitutes simmering stock or broth instead of hot milk. This is a fancy French name for good old gravy and the use of homemade stock will make it rich and delicious. 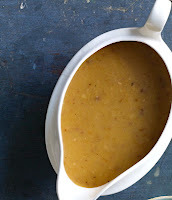 Replace the milk in above recipe with chicken, beef or vegetable stock and you will have the most amazing gravy!